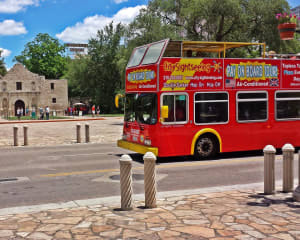 See all of San Antonio's historic and popular sites at your own pace on this 48 hour hop-on-hop-off bus tour. See all of San Antonio's historic and popular sites at your own pace on this 48 hour hop-on-hop-off bus tour. You will have the freedom to hop off when you would like to visit the shops and restaurants at Market Square and all you have to do to continue the tour is hop back on when the next bus comes around. Typically there are 4 busses traveling the city route, so busses come and go at each stop roughly every 30 minutes.